Damien's brilliance would truly emerge with the release of 2003's Sieze The Day, a tour-de-force of folk and rock influenced songs that bristled with passion, anger, and defiance, but also compassion and hope - qualities which have come to define both the man and his music. Five further studio albums followed - all going Top 10 - culminating in last year's 'best of', It's All Good. Damien laughs when I point out he is now close to 20 years in the business. "You're making me feel old!" he tells me during our Monday afternoon interview. "I'm very lucky that I am still recording and playing gigs. When I started out there were very many talented people I knew playing music, but who are not any more. They couldn't sustain a living from it and had to go get jobs. I'm one of the lucky ones." Damien is currently in Kilburn in London, recording with long time collaborator and producer John Reynolds, what will be his sixth album of original material. "We're working on what might be the title song, 'Soul Sun', it should be out early next year," he says. In discussing the embryonic new album, the Dubliner reveals much about what motivates him as an artist, and his working relationship with Reynolds. "I'm trying to make music that means something, that resonates with people," he says. "I want to give people hope in the music, to help them through dark times, and include some of the wisdom I've picked up along the way. I never want to repeat myself from album to album. When I'm working with John he won't be afraid to say 'You did that on your last album, do something different this time', and Soul Son will be a bit different." A key difference is a move away from the overtly social/political songs of previous albums - he admits many were surprised that Almighty Love did not spend more time addressing the banks and the recession - towards a message more focussed on spirituality. "'Soul Son' is about the light that shines from within," he says. "They're spiritual songs about new beginnings. We've been pushed away from spirituality by the scandals in the church, by what was done in the industrial schools, by the hierarchy not letting women say Mass, or not letting priests marry. The Irish were always very spiritual people, going back to the Celts, the spirit of the land, the sea, the river. In these songs I'm trying to get people to believe in something, the light within; you could say they are songs about 'keeping the faith' - I don't have a name for what that faith is, but it is there, it is something." Yet Damien's interest in socio-political issues remains undimmed, as illustrated by his view on how Ireland should commemorate the 1916 Rising. "I'd like the Irish people to think about what the signatories to the Proclamation had in mind and what they would like to see for Ireland now," he says. "I don't think they would like to see the selling off of the coutnry, they'd be angrered by that. I don't want to see a parade and then we forget about it. We need to discuss their vision. They had a great vision." Spirituality is a broader experience than religion, and is not necessarily always related to religion. Indeed it can be encountered in the most seemingly secular of activities, and for Damien, songwriting is a spiritual activity. "When you're writing a song you can go into a trance," he says. "It's meditative. Sometimes songs come out of nowhere. You're excited about it and it can be good to get things out of you, an itch you have to scratch. It's good for anybody to write down their thoughts. It's a healthy process for me, and getting people to sing along with your songs, is a great buzz. I get a natural high from it. It's like drugs, without the downside of drugs. It's a spiritual thing for me." Damien has long cited Christy Moore, Luke Kelly, and Phil Lynott as inspirations, but Irish literature also informs his songwriting. "Kavanagh is one of my favourite poets," he says. "I also love Joyce. I love Dubliners and Portrait Of The Artist. Ulysses is a bit tough. I'm also getting into Yeats. I found him difficult when younger, I didn't study him in school, but now I'm older I understand him more." Songs about closeness to the sea and the rivers also hint at one of Damien's great passions outside of music - swimming, something he manages to fit in during recording sessions for the new album. "I love outdoor swimming," he declares. "I swim in the ponds at Hampstead Heath. It's amazing, you'd never know you were in the middle of London. Swimming is a great way to connect to nature. I feel at one with the world. I always find I sing much better on a day when we've had a swim. It's great for quality of life as well, some of those guys who swim all year around, they tend to be long livers." Damien is coming to Galway tomorrow to play a Galway International Arts Festival show at Monroe's Live. As usual when in Galway, he likes to go for a dip in Blackrock. Indeed, is no stranger to this part of the world, having regularly spent time here since childhood. "My people are originally from Kilmane in Mayo and Tuam, but went to Dublin and Manchester," he says. "We have family in Salthill as well, where we'd always holiday once a year. I'm looking forward to coming to Galway to play the show, swim in Blackrock, and hang out enjoying the buzz of the arts festival." 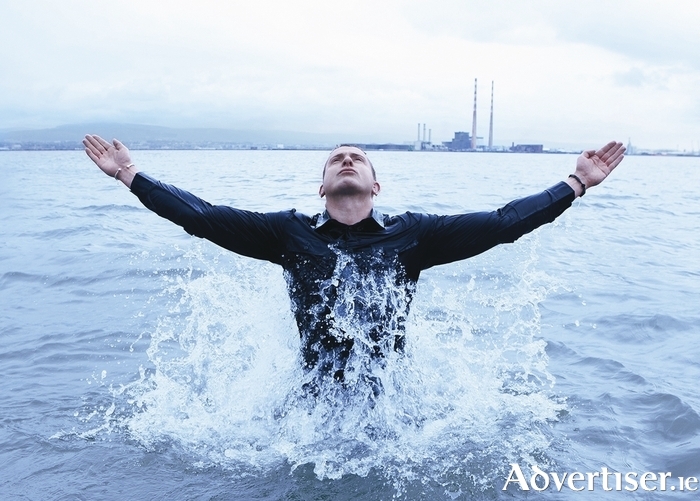 However swimming in County Galway also gave Damien the fright of his life at one stage. "I was on Inis Óirr and there was a dolphin who nearly got me," he recalls. "He accidentally slammed into a girl and she was showing me the bruise he'd left. I went in swimming and I love taking time to float on my back. I was just floating when I saw this fin coming towards me very fast. I got a fright and ran out of the water screaming, everyone on the beach hearing me scream like a little girl, and the dolphin followed me right up to as close to the shore as he could go! People were having a laugh saying 'Some hero you are'. If I'd stayed in the water I don't know what would have happened."